When he was a university student learning about industrial design in Switzerland, Andres Schneiter was subjected to strict discipline from his instructors. Papers had to be stacked neatly, tools put away. Vices (the type mounted to work tables to hold projects in place) had to not only be dialled back to their proper positions; all the handles had to be aligned at a 90-degree angle to the floor. The training in proper processes would serve him well through a 25-year career in telecommunications. Schneiter had already been a longtime hobbyist when it came to making wooden furniture, but he decided to devote himself to the pursuit full time after the telecom industry crashed in the early 2000s. The workshop on his expansive Maple Ridge property is scrupulously clean, warm with the heat emanating from a stove burning otherwise unusable pieces of scrap. Wood is carefully sorted according to not only the size and type of the pieces (maple, pine, oak), but right down to the tree it came from. That allows him to match the grain of the pieces for his furniture. "Look at this," he says, gesturing to a massive combination hutch and sewing desk, meant for a seamstress client in Europe. "See how the pattern matches exactly on those drawers there? I sacrificed an entire sheet of wood to do that." There is also a massive vertical slice of a tree, fitted on one corner with a slab of blue slate to replace an area where the wood had rotted away. The entire thing had to be hand-planed, since there aren't any machines that would fit such a huge piece. Intended to form a tabletop, the piece weighs 360 kilograms. In another corner is a piece with a twist on the traditional look of a dining table: the table top is French oak, and the "legs" holding it up are glass. Tucked away in another corner are two sawn-off lengths of a hazelnut tree trunk, burled in an unusual pattern. He has turned them into lamps. "I only take trees that would have to go anyway -- maybe part of the tree is sick, or the lot is being developed. A lot of the developers around here call me before they cut anything down," Schneiter explains. "I can create an exactly matching dining room suite from one tree. Very few other woodworkers have that kind of access to the trees." Schneiter uses traditional methods of joinery and marquetry to bring out the natural beauty of the wood, eschewing nails unless they're absolutely necessary. He understands why people buy mass-produced furniture -- maybe it's what they can afford at the time, or maybe they're looking to pick up something quickly -- but he says custom furniture is worth the price. "It's a special piece. Maybe it fits an odd-sized alcove in your home, or you want it to match something specifically," Schneiter says. "Some people want a coffee table that makes a statement. It looks like a piece of art." 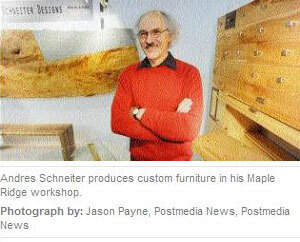 While word of mouth and his website -- www.mapleart.ca -- helps to bring in a lot of business, Schneiter says it's important to show individual prospective clients his work. He brought the pieces mentioned above to the recent Interior Design Show West exhibition in Vancouver to exemplify the difference between custom craftsmanship and everything else out there.